Lightning kills about 40 people a year in the highland areas of Peru. 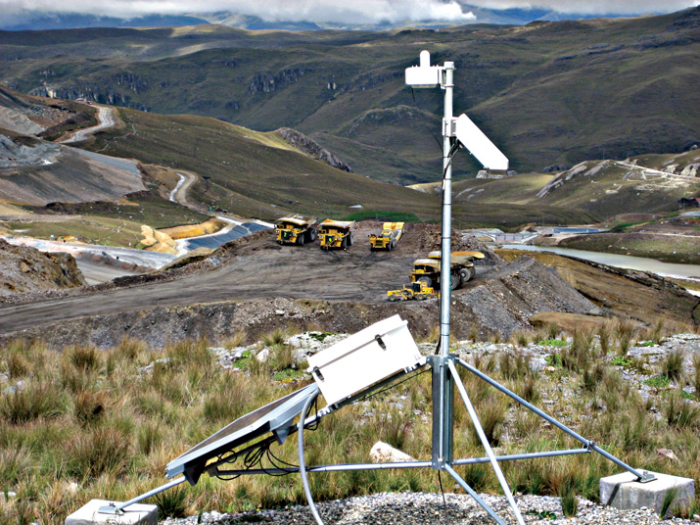 This startling fact motivated Barrick Gold Corporation, the world's largest gold mining company, to set high standards for lightning protection at its Lagunas Norte facility, a high-elevation, open-pit mine in this lightning-prone region. Hundreds of workers at this facility operate mining and processing equipment around the clock, all year long. Some of the work areas are protected from lightning strikes with catenary wires strung to attract and absorb lightning, but mine managers depend heavily on the CS110 Electric Field Meter to warn of dangerous lightning conditions. This safeguard was implemented in 2006, when engineers from Campbell Scientific designed and supervised installation of a comprehensive lightning warning system. Campbell supplied CS110 systems (with embedded CR1000 dataloggers), tripods, enclosures, power supplies, and solar panels. CS110 systems monitor lightning potential at two locations. The primary system is positioned near the dispatch center and includes a Strike Guard lightning detector from Wxline. The other is about 3 kilometers away, near the housing structures. Both systems communicate through fiber-optic modems, and the data is displayed on the Internet and viewed at the dispatch center. When either of the CS110 systems detects rising potential for lightning, it sends alarms to the dispatch center and personnel are put on alert via radio. If the danger increases, vehicles are positioned near workers for quick evacuation, and when the danger reaches a red alert all people are moved to safe shelters. The season for frequent lightning lasts nearly half the year, and the warning system proves its value nearly every day during that season. Evacuations are frequent, but the system allows work to recommence as soon as conditions are safe again. Safety and productivity are not based on guesses, but on well-researched and closely monitored standards that protect the workers and let mine operations continue as much as possible.